Plans by Ofgem to introduce a price cap for pre-payment customers would not solve fundamental problems with the energy pricing system, according to Energy Advice Line. Julian Morgan, managing director of the price comparison, switching and advice service for energy users, said the proposal aimed at helping vulnerable customers did not include incentives for more people to engage with the market and switch suppliers. "Ofgem has announced it will go ahead with recommendations made by the Competition and Markets Authority (CMA) in its report earlier in this year for four million pre-pay customers to have their energy bills capped," Mr Morgan said. "It is true that these customers need help because they're paying an average of £220 a year more than those on the cheapest deals, because suppliers say pre-meters are more expensive than standard. "But the plans do not address the energy market's fundamental problem. More than 70% of the customers of the Big Six suppliers are on standard tariffs - by far the most expensive on the market. Quite simply, they are paying far more than they need to, and this isn't fair. "The CMA report didn't go far enough to incentivise the vast majority of customers who are disengaged from the market and paying over the odds." Bosses at First Utility, one of the UK's smaller energy companies, has suggested that Big Six customers who do not switc hsupplier after a certain period of time should automatically be flipped to the best tariff. 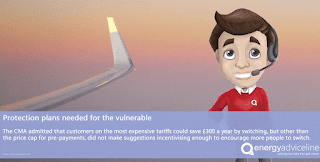 In this report, the CMA admitted that customers on the most expensive tariffs could save £300 a year by switching, but other than the price cap for pre-payments, did not make suggestions incentivising enough to encourage more people to switch. It recommended that current rules limiting suppliers to a maximum of four tariffs should be scrapped in order to promote more competition. It suggested that energy firms that supply micro-businesses - those that employ fewer than 10 people - should be forced to be more transparent, by publishing their prices. The report also said that these tiny SMEs should not be locked into expensive 'roll-over' contracts. "These suggestions are all well and good, but will do little to reduce the pain of householders and businesses struggling with high bills, or encourage them to shop around and switch," Mr Morgan said. The Energy Advice Line is a consumer champion and an independent price comparison and switching service for householders and small and medium-sized businesses. The service enables consumers to quickly and simply compare electricity and gas prices, and to switch to the best available deal on the market. Record numbers of consumers switched energy supplier in July despite the summer holiday break, but millions are still paying over the odds for their gas and electricity, according to the Energy Advice Line. 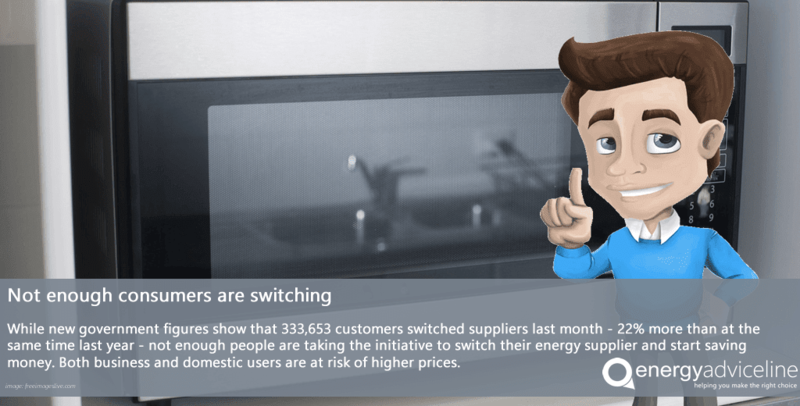 New government figures show that 333,653 customers switched suppliers last month - 22% more than at the same time last year - bringing the total number of switchers for the year to 2.7 million. "These figures are obviously good news, as switching is the best and cheapest way to save money on your energy bills," Mr Morgan said. "This fact is confirmed by the government and the regulator. 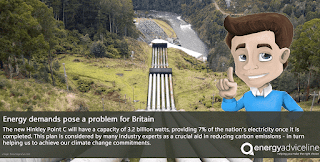 "The problem is that according to a recent report by the Competition and Markets Authority (CMA), 70% of the customers of hte Big Six suppliers are languishing on the most expensive standard tariffs. "In other words, the vast majority of energy consumers in the UK could switch to a much cheaper deal - and save £300 a year in the process - but they don't. "So while these recent figures are a step in the right direction, there is still a very long way to go." The figures also show that 76,174 customers switched to small and medium suppliers in July, representing almost one-quarter of all switches. Mr Morgan said that this suggested consumers continued to lack confidence in the Big Six suppliers. The government claims the record number of switchers is a result of government initiatives to make the switching process simpler, and by highlighting the benefits of changing supplier. But Mr Morgan said more incentives were urgently needed to incentivise long-term non-switchers to engage with the market and save money in the process. "Various initiatives have been put in place, such as providing customers with clearer and simpler information on their bills in order to be able to compare prices more easily," Mr Morgan said. "But lots more needs to be done to persuade people who never shop around to do so, and to convince them that the savings that can be achieved can be considerable." "I urge anyone who hasn't switched supplier recently - particularly the large numbers who haven't done so for years, to seek out some of the great deals that are around at the moment," Mr Morgan said. "Using a reliable and independent service like the Energy Advice Line makes it quick and simple, and could potentially save you hundreds of pounds." The service is completely independent and free. Consumers can quickly and simply search the market for the best available energy deals from an extensive panel of small and large energy suppliers. The service also offers a free advice line for business energy customers. 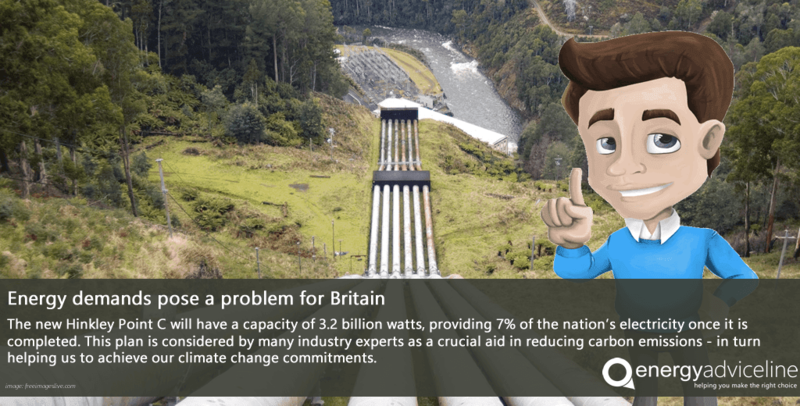 Energy demands have been steadily rising in Britain - but do we face a problem in coping with these amounts required? The new Hinkley Point C will have a capacity of 3.2 billion watts, providing 7% of the nation's electricity once it is completed. This plan is considered by many industry experts as a crucial aid in reducing carbon emissions - in turn helping us to achieve our climate change commitments. While most of the energy required will be produced by renewable technologies, Hinkley will be there to generate the remaining power. In the future coal and gas will not be viable methods for this back up energy due to the emissions involved - that leaves us with nuclear to pick up the empty space in the market. Delays to the construction of Hinkley have forced the industry to ask itself, where else can we get the power from? Until we have a method of storing energy generated from renewable sources at an industrial level, we will always require an alternate method. This research is currently underway, but could take decades to complete. One alternative is to continue with our use of fossil fuels, but being smarter in the way we use the residual carbon dioxide - it can be liquified and pumped back into the ground, also known as carbon capture and storage. Many geologists and energy experts believe that the empty oil fields in the North Sea will be the perfect location for storing this recycled substance. Hinkley Point C, owned by EDF, was given the go ahead earlier this summer but has since had it's confirmation delayed by the government and the expected cost of the project is predicted to add an additional £37 million on to consumer's bills. The Energy Advice Line has urged energy users to regularly switch suppliers following a new report predicting households will be paying £100 per year more for their energy within five years. Julian Morgan, managing director of the price comparison, switching and advice service for energy users, said the report showed the importance of keeping on top of rising prices by switching. Independent energy consultancy Cornwall Energy predicts that household bills will have to rise to fund government policies designed to keep the lights on a support green energy. "Policies designed to play a key role in fighting climate change don't come cheap and they will be a bigger fact of life in years to come," Mr Morgan said. "But this doesn't mean there's nothing consumers can do to protect themselves from these extra costs - it's just a question of being a savvy shopper. "This means not accepting the first deal that comes your way and seeking out the best bargains - the same approach you would take for any significany purchase. "And with the costs of energy subsidies predicted to rise substantially, there's even more at stake than there was before." 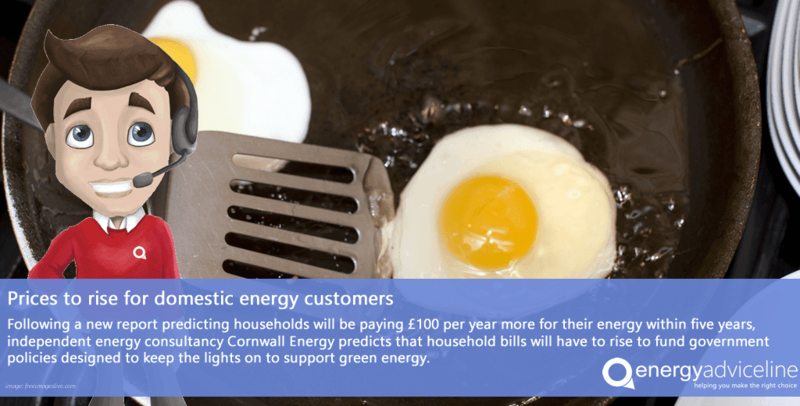 The Cornwall Energy report said the subsidies paid by consumers to help suppliers cover the cost of various green energy policies would have risen by 124% by 2020 - 2021. Analysts said that while the future cost of the actual energy remained uncertain, the costs of green energy policies were only heading in one direction: up. The government claims it has taken various steps to reduce the burden on customer bills in the past 12 months, largely on the back of lower wholesale energy prices, but suppliers have been harshly crticised by consumer groups for not offering more generous cuts. "Consumers really have to vore with their feet," Mr Morgan said. "There's nothing they can do about the subsidies that add extra costs to their bills, but consumers can switch to lower cost competitors and make significany savings in the process. "Many energy users feel there is nothing they can do about these extra costs but, indirectly, there certainly is - by moving to suppliers where tariffs are lower. "That's why it makes sound financial sense to use our free service - it's independent, impartial and quick. With a few strokes of a computer key consumers can see how much they save - and then we do all the legwork to arrange the switch." The Energy Advice line Line is a consumer champion and an independent price comparison and switching service for householders and small and medium-sized businesses. The service enables consumers to quickly and simply compare electricity and gas prices, and to switch to the best available deal on the market.